A KVM Extender eliminates the need for expensive, fully ruggedized PCs; instead, our industrial workstation can be connected to a standard PC in a centralized, clean location. We have integrated KVM Extenders with our monitors so they can be seamlessly mounted to the rear of our Universal Mount Monitors or VESA-mounted to the rear of our Panel Mount Monitors. There are many KVM Extenders on the market, but they don’t all necessarily work well in industrial environments. Using KVM Extenders can sometimes be challenging in settings where there is a lot of electromagnetic activity from motors and other factory equipment. We have done extensive testing over the years and found the AdderLink KVM Extender technology works well with our touch screens and is ideal for industrial settings. For more information, see our blog post on using shielded CAT5 cable. For applications where the monitor and PC are within 15.2 m (50′) of each other, we offer a number of direct cabling solutions. When your application requires that the PC be located more than 15.2 m (50′) away from your industrial monitor and other devices, we recommend using one of our KVM Extender options. We offer several KVM Extender solutions for two different length requirements: 60 m and 300 m.
60 m KVM Extender – extends VGA and full-speed USB up to 60 m (198’) away from the PC using dual shielded CATx cables. If extending VGA video only, distance of up to 150 m (500’) is possible. 300 m KVM Extender – extends VGA and full-speed USB up to 300 m (1000’) away from your PC over a single shielded CATx cable. PS2/Serial versions are also available to extend VGA, PS2, and RS-232 serial data. If your application requires centralized control of multiple operator stations across the facility, the 300 m KVM Extender is the perfect solution. 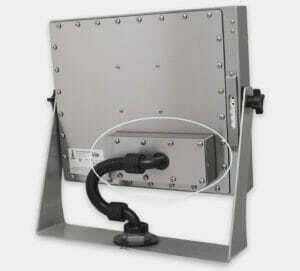 Both versions (60 m and 300 m) are available in monitor-mounted configurations (pictured above). 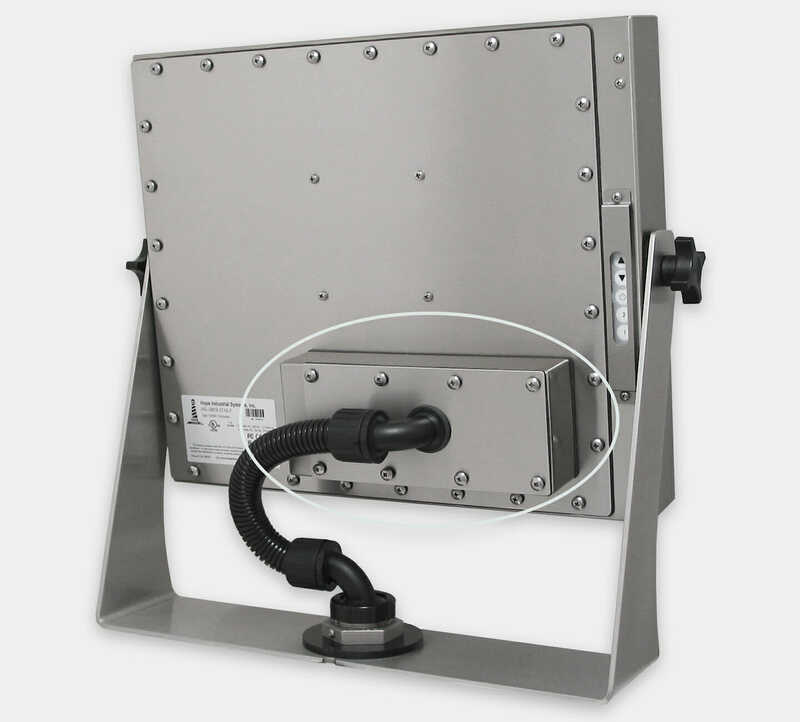 The Monitor-Mounted KVM Extender is mounted in a NEMA 4/4X/12 stainless or black powder-coated steel enclosure that attaches to the rear of a Hope Industrial Universal Mount display. All cables are routed through the KVM Extender and are suitable for wash-down environments. 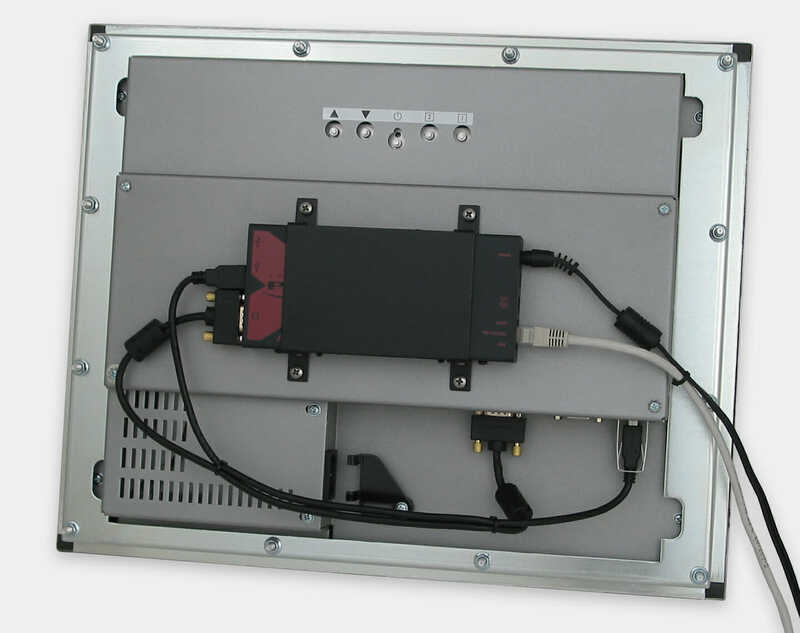 The 300 m KVM Extender is also available in a stand-alone version that can be placed behind a panel or VESA-mounted to the rear of one of our industrial Panel Mount Monitors. All of our KVM Extenders include our standard 3-year warranty, 30 day total satisfaction guarantee, and industry-leading service and support. 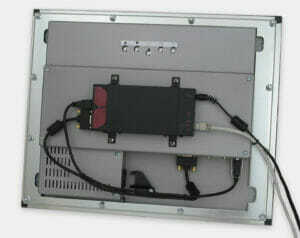 Visit our website for additional information and pricing on KVM Extender options.